Why are the Christmas light still there in January? What function do they have now? Their time is over and they hang like a monument to yesterdayʼs party. We wondered why we could not design our own lights? 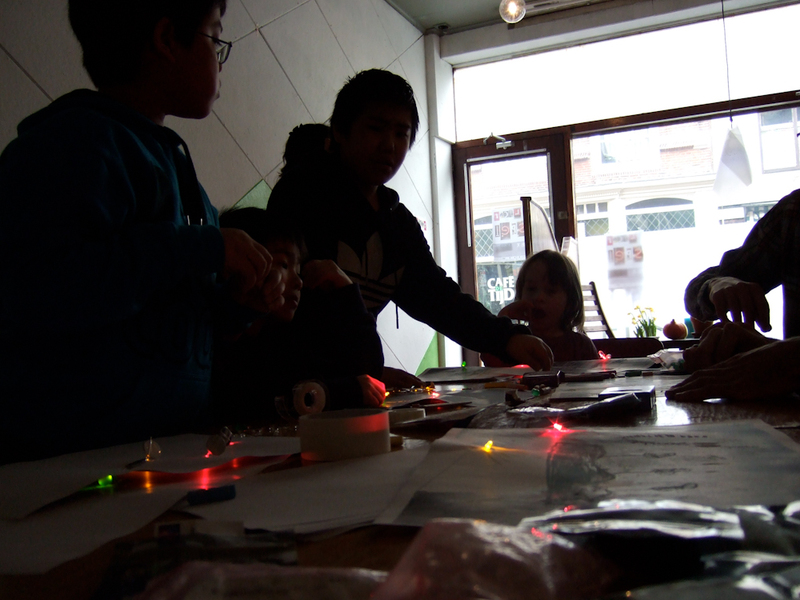 Our first action in the Voorstraat was a workshop for the children in the street to build lights for the streets and the windows. Using photocopied pictures of the street, chalks, LEDs and button batteries, we design and imagine new dramatic lights for the environment we live in. Take a picture of your street and print it out on paper. Draw your imaginary lights on the picture with chalk. A dragon in the sky, a catalog of shops by the colors of light. Add the LEDs. Put the LEDs from front of paper to the back, and tape the battery on the backside. Donʼt forget to show your idea to other people. Materials: Photos, LEDs, batteries, chalk.